Find out the latest developments here on our blog. Millions of blog posts get published online every day. Those millions of posts come from hundreds of thousands of bloggers that write content either as a hobby or as a means of making serious money. Wherever you fall in the hobby/professional blogger spectrum, it’s important that you’re aware of the basic legalities that govern blogging. Doing so can help you craft better content that is less likely to get you sued. Does your blog collect information from its visitors? Things like emails for mailing lists, logins for user accounts, or payment information for sales all qualify. If you collect information from the people that visit your blog, you’re going to want to have a robust privacy statement published somewhere on your site. Privacy policies let users know how you leverage their information. While most people don’t ever read them, you’ll occasionally bump into a litigious person that’ll take you to court for not having one. Have you ever wondered why mailing providers like MailChimp ask for your address when you’re signing up? It’s because they’re legally required to publish it on the bottom of your emails. Sending emails without your address or with a fake address can get you fined, per email. Save yourself some serious money and make sure your mailing address (or PO Box) is always on the bottom of communications you send to readers. In an effort to cut down on email spam, laws exist in the United States and Europe that require marketers to respect email out outs. That means, if someone asks to get off of your mailing list, you need to leave them alone. Most mailing service providers will provide opt-out buttons automatically for you that are in compliance with laws. Just be sure to not manually re-add customers to your email list who have asked to be left alone. Many bloggers host giveaways as a means of drumming up email opt-ins and to grow their blog’s audience. Few, however, know that gifts are sometimes taxable. If the gift you give away on your blog gets valued at over $600.00, you’ll need to send the recipient a 1099 tax form at the end of the year so they can report it to the IRS. Have you ever seen bloggers include the © symbol at the end of their posts? Many do this because they think that without a copyright symbol, people can steal their work. Fortunately, copyrights are inherent meaning that you own the copyright on your work the moment your work is published. You’ll still need to prove that your work is original if ever you need to fight a digital pirate but having a © present isn’t going to make or break your case. If a brand pays you to pump up their products on your site, you can’t pretend that you love their products without disclosing that you’re getting compensated. Doing so could violate US and European commercial transparency laws. Bloggers are business owners and the IRS loves taxing business owners. As a blogging tips for beginners rule of thumb, if you’ve made more than $400.00 from your blog during the year, you’ll have to report that income to the IRS. Failure to do so could result in an audit. If you remember one blogging tip for beginners suggestion in this post, let it be this… The moment you launch your blog, you’re considered a sole-proprietor. As a sole-proprietor, if you’re sued by someone, they can come after not only the money your blog has made, but everything you own. To separate yourself as a person from your business, consider structuring your blog as an LLC. Blogs with LLC protection can only lose assets (in most cases) owned by the blog. That means that your car, home, retirement fund, etc. will be safe. If you use stock imagery you pull off of the internet for your blog posts, make sure you understand those photo’s licenses. Only a handful of photos online are “labeled for reuse”. Those that are may require that you offer a certain degree of attribution in order to legally use them. If you violate a photo’s license you may get asked to cease and desist by its owner. Unless you want to stand behind everything you say on your blog in the eyes of the law, it’s important that somewhere on your blog you include relevant disclaimers. For example, while the information being presented to you in this article is being offered to you in good faith, we’re not attorneys. As such, all legal advice should get sourced directly from a qualified lawyer prior to making any final decisions regarding your blog. With a disclaimer like that in place, you can protect yourself from malicious people that are looking to make money off of your oversights. We hope that our legal blogging tips for beginners provided you with insight that you found valuable! As it turns out though, legal advice isn’t our forté here at iWriter – Writing is! If you need help creating a steady stream of high-quality, SEO friendly blog posts for your business or hobby blog, we’ve got you covered! Learn more about our services and pricing and start taking your blog to the next level with iWriter today! How Long Does It Take to Make Money Writing a Blog? Why is Blog Post Content So Important to My Google Rank? 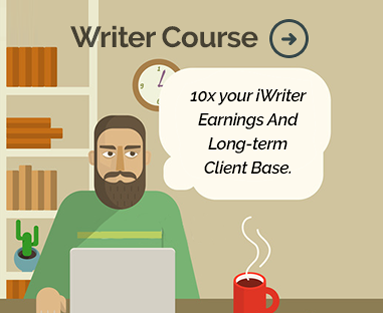 iWriter is the fastest, easiest and most reliable way to have content written for your website. You'll be able to post a project and 1000s of freelance writers from across the globe will have instant access to write your content quickly, professionally, and affordably. Copyright iWriter 2018 All Rights Reserved.